Sometimes you are in need of a cat litter management system that never needs anything after you set it up for once. This is quite difficult but not impossible because of the fact the CatGenie Self-Washing and Self-Flushing cat box are here on the market to make sure you will need nothing else but this automatic cat litter box for your cat. ​This is an advanced version of cat litter boxes that are available today and allow you to have a complete toilet like system for your cats to use and keep them clean and tidy. ​Due to the well-designed system the litter box washes away all the dirt with the help of an automatic preset system that you can use by selecting from the three given options. One is used to preset the time for 4 times cleaning in the whole day, the other is for manually starting the cleaning and the third is the cat stimulated cleaning process. ​The litter box uses washable granules that are biodegradable and are automatically washed after each use. These are completely safe and get dried with the help of built-in system to make sure the cat can work things out easily by digging and covering the wastes. The granules are biodegradable and if get displaced, they degrade automatically within 9 months so no hazards will be caused to the environment. ​​The self-flushing system washes the granules to remove the liquid waste and also the solid wastes are removed through an automatic scoop that disposes of the waste after liquefying it and flush away through the drain hose. In this way, the system works as an automatic flush that does not have to be cleaned manually and takes care of dirt with an automatic system. ​The system is run with the help of two hoses one of water inlet and the other to dispose of the wastes after cleaning is completed. It runs with the help of electricity. ​​The litter box needs to have a place in the laundry room or in the washroom as it needs a water inlet and drain as well. It is an advanced cat litter box that works best for 2-3 cats in one home. 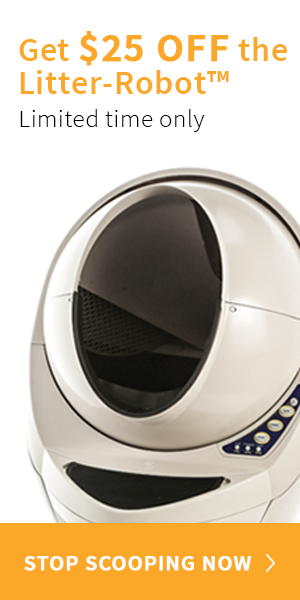 It offers a clean and hygienic system that keeps the litter box clean through regular flushing and washing of the granules like litter which is washable and reusable. You don’t have to scoop out the wastes, change the granules or remove the dirt bags, rather the wastes are flush out automatically. You can set the self-flushing system to automatic or manual start features according to your convenience or as per your cat needs. That make it sure that there will be no odors or dirt in the box, anytime. Perfect for multiple cats in the home when you have maximum three cats that may use the litter box. It can keep up with the frequency of usage as you don’t have to replace the granules and they will be washed automatically keeping it clean and dry all the time. The granules are washable and biodegradable so you will have a setup that is safe to use and has no harmful effects on the surrounding environment. It is of a huge size that needs to be placed properly in a specified place and if you don’t have much space you may have issues settling it in your home. It needs a water supply and a drain hose for a consistent water inlet and waste disposal so you need to find a proper location where you can have a switch as well as inlet and outlet options for both hoses in the correct manner. It may not work for more than 1-2 cats in a way you need and you will have to face certain handling and cleaning issues if you have more cats as you will need to use the manual cleaning function every time one of your cat uses it otherwise it can mess up all the system if multiple cats keep on using it frequently. ​In a nutshell, this self-flushing and washing system or litter box is perfect for your cats when you don’t want to handle the litter manually. In this way, you will never have to handle or see anything smelly or the waste dispersed on your floor. The litter box has been designed to provide maximum hygiene and clean environment so that there are no odors and unwanted smells.